The Deckel tool and cutter grinder has long been the world leader in grinding small, straight-fluted cutters for the metal working industry. No tool and die shop should be without one or more of these grinders. Many have been in use for over 40 years! 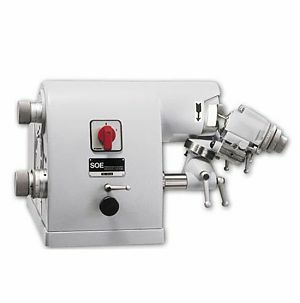 The Deckel grinder model SOE is a truly unique and versatile piece of machinery that holds its value even after many years. Please note the 110volt 1-Phase motor is no longer available. Dimensions: 27"x 23" x 13"
Download a copy of the model SOE Parts Manual on our Deckel Collets & Parts web page. Deckel grinder shipped via freight collect/Best way. Extra charges will apply. Basic shipping fees do not apply.